"If you’re ready to let go of a piece of jewelry, we can help you assess your options – sell it, scrap it, or remake it into something new." Over time, jewelry can become dated or is no longer loved like it once was. Or perhaps you inherited a Glad ziplock storage bag of old jewelry that you don’t think you’ll ever wear, even though you appreciate its sentimental value. People often come in asking about what they should expect to receive for their gold, silver, platinum and gemstones if they want to sell it, and we’re always happy to give you guidance based on current market pricing. 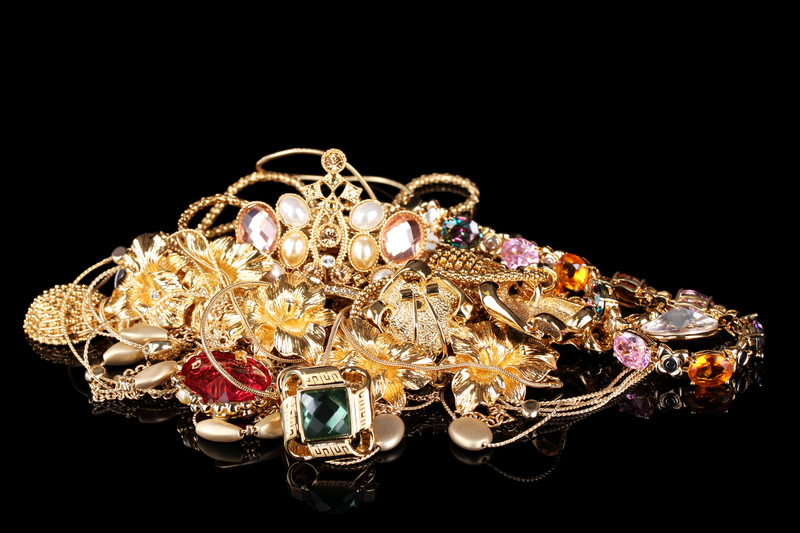 When we assess a jewelry collection we’ll help sort out any pieces that may have intrinsic value as a finished piece. Often gently worn pieces, such as an engagement ring, can be professionally refurbished and resold. Designer or antique pieces displaying excellent craftsmanship and good quality stones are also never out of fashion. Even well-crafted costume jewelry is coveted among many collectors. We can bring these pieces to your attention, a quality finished piece may be more valuable intact than as scrap. We have a display case in our shop dedicated to displaying antique and high end jewelry that would be of interest to other buyers, should you ask us to sell it on your behalf. We also have a very active on-line store where we can list pieces; there’s bound to be someone, somewhere in the world, that appreciates the beautiful piece that no longer brings you joy. Because we’re a bricks and mortar location with an excellent reputation, we are often able to sell jewelry at a better price than someone selling privately – we can go over options with you if you are interested. Sometimes, however, old jewelry is just old jewelry, and has no value aside from the metals and stones it contains. You generally have two options. If the stones have sentimental value we can set them aside (or give them back, if you’re not quite ready to proceed) to be repurposed into another piece. You’ll also be given a credit at fair market value for the metals that will be used in the new project. If you want the cash instead, Barbara Oliver Jewelry is licensed in Erie County to buy used jewelry. When we scrap out jewelry we dismantle it, test the metals for purity, and then weigh both the metals and stones. We’ll tell you what you should expect to receive for your gold and gem stones should you decide to shop around. In many cases we’ll also make an offer ourselves, and explain exactly how we came up with the amount based on current precious metal prices and diamond and gemstone wholesale tables. The way we buy scrap jewelry is transparent and fair, and you’re always welcome to take our offer and test it on the market. Almost invariably you’ll discover our offer is in the high end of the ball park. Diamonds are, of course, the most actively sought after stones. As you probably know from reading up on the 4 C’s, carat weight is just one of four factors that are considered when a stone is appraised. Diamonds with older cuts that were created before the advent of modern cutting geometry may appear lifeless next to a modern stone. Clarity, color, cut and of course, the carat weight, interplay with each other to drive the market value of a given stone. We will explain all of this, and we’ll help you to see for yourself why your stone is valued as it is. We are also qualified and certified to appraise colored stones, and again, are more than happy to help you sort out your options for your colored gem jewelry. If you have questions, or need some unbiased and professional guidance on what to do with your jewelry that you no longer wear, we hope you’ll stop by. When you're ready to go over your options, we're ready to help.